Djúpavík is located in the region Strandir at the eastcoast of the westfjords in Iceland. In 1984 Eva and her husband Ásbjörn purchased the former living house for the women, who worked in the factory. Soon after they opend the "Hótel Djúpavík". They live in Djúpavík the whole year-round. 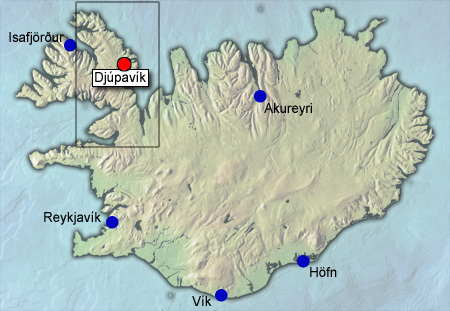 In the district Árneshreppur - Djúpavík belongs to this district - live around 35 persons. The nearest town is Hólmavík - about 70 km far away, with around 400 residents. Some travel agencies which offer travels to Iceland and overnightings in Djúpavík are listed here (in german). 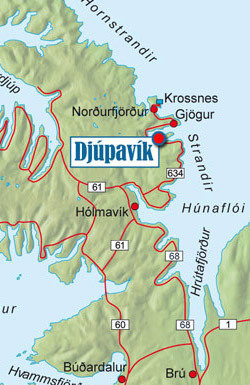 Link to Djúpavík Hotel: www.djupavik.com.